The explanation below is being circulated within the expat community, specifically among parents of students at the British School in Tokyo. Our PTA president is, awesomely, an American who spent the first 7 years of his career working in the nuclear industry, as a field engineer who spent many hours on top of, along side of, and underneath the actual reactor pressure vessel. 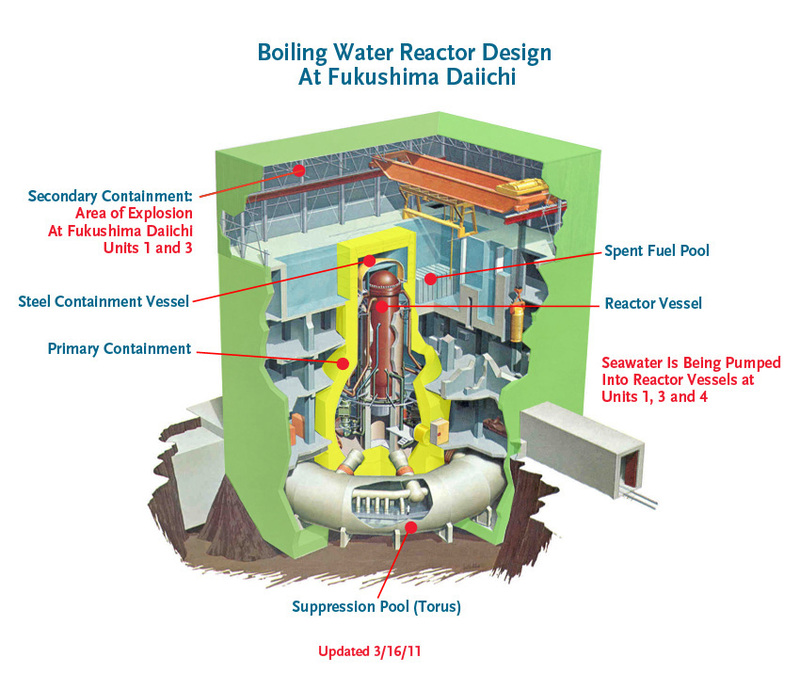 In the late 1990s he project managed the fabrication of replacement parts that are currently inside of Fukushima 3 and 5 (two of the six reactors at the nuclear power plant where cooling systems failed after the tsunami caused by the March 11 earthquake knocked out its emergency generators). A spent fuel pool is a steel lined concrete structure that is right next to the reactor vessel (see attached). It looks a lot like a deep swimming pool. A nuclear reactor shuts down every 18 months for what is called a refueling outage. During this refueling outage, approximately 1/3 of the fuel is taken out of the core and moved to the spent fuel pool and new unused fuel is put into the reactor. So imagine your reactor core is one big birthday cake and that 1/3 of your candles have burned down so much that you have very little light from them. So you take those 1/3 candles off the cake and put them a bucket of water (spent fuel pool) because even though they aren't burning bright enough to provide you the light that you desire (don't generate enough heat to boil the water at all or efficiently), they can still smolder and burn your fingers if you touch them (decay heat). The new fuel are the new candles that have never been lit (thus they won't burn your fingers at all) and once they go inside the reactor core the flame on the candles next to them (fuel still in the reactor that can produce significant heat through nuclear reaction) "lights" them (starts the nuclear process). The spent fuel pool is kept full of water (16 feet over the height of the fuel bundles) for two reasons. One is to keep the spent fuel cool since there is still decay heat, and two to provide shielding from radiation. Deionized water is an effective shield to radiation. I have walked past the spent fuel many times and looked straight down at spent fuel bundles. Having the spent fuel become exposed is a very bad thing. They are still highly radioactive and as they become more uncovered due to evaporating or leaking water from the spent fuel pool the radiation levels in the area will spike significantly and remain significantly higher until either the water is back up over the fuel bundles or they are moved into dry storage (called casks). What appears to have happened or is happening is that the spent fuel pools at at least one of the sites has dropped down to the height of the fuel bundles (exposed them to air.) I assume that Tepco is trying to refill the spent fuel pools with the helicopters dropping buckets of water and fire hoses. This is obviously a very short term solution but if they can get them sufficiently covered by these methods, then the radiation levels should go back down which would allow workers to get closer to spent fuel pools to execute a longer term solution. Spent fuel is still highly radioactive and can cause harm to human health. However, since it is spent fuel, it is very very unlikely that there would be a meltdown or start a nuclear reaction. I do not have access to radiation levels as of late, but as mentioned in a prior email, distance from the source significantly reduces the level of exposure. So if the plant provides a radiation level (most likely in microSieverts/ hour) I have assumed that number is at the plant boundary, say 1 km from the source (reactor). Tokyo is about 200 km away so you would divide the number that you are told at the source and divide that by 40000. So, for example, if the radiation level at the source is 100 microSieverts/ hour, that should equate to 100/ 40000 or .0025 microSieverts / hour in Tokyo; a significant decrease. If you are told a value that is in milliSieverts, that it different than microSieverts. 1 millSievert is the same as 1000 microSieverts. I do not want to sound insensitive to the situation affecting our neighbors to the north of us. My messages have been very Tokyo centric given that you are all most likely living in Tokyo or the surrounding areas. If you do have friends or family within the evacuation zones I would urge them to move out of them as soon as possible.